On this live lecture program, these bestselling authors tell you how to manifest anything you really, really, really, really want! Learn how to start getting your heart’s desire by first, becoming a self-actualized person; second, being independent of other people’s opinions; third, being detached from outcomes; and fourth, being free of any investment to have power or control over other people. Wayne Walter Dyer (born May 10, 1940 in Detroit, Michigan) is a popular American self-help advocate, author and lecturer. His 1976 book Your Erroneous Zones has sold over 30 million copies and is one of the best-selling books of all time. It is said to have "[brought] humanistic ideas to the masses". Wayne W. Dyer, Ph.D., is an internationally renowned author and speaker in the field of self-development. He’s the author of 29 books, has created many audio programs and videos, and has appeared on thousands of television and radio shows. His books Manifest Your Destiny, Wisdom of the Ages, There’s a Spiritual Solution to Every Problem, and The New York Times bestsellers 10 Secrets for Success and Inner Peace, The Power of Intention, and Inspiration have all been featured as National Public Television specials. Dyer holds a doctorate in educational counseling from Wayne State University and was an associate professor at St. John’s University in New York. He first pursued an academic career, publishing in journals and running a successful private therapy practice, but his lectures at St. John's, which focused on positive thinking and motivational speaking techniques, attracted students beyond those enrolled. A literary agent persuaded Dyer to package his ideas in book form, resulting in Your Erroneous Zones; although initial sales were thin, Dyer quit his teaching job and began a publicity tour of the United States, doggedly pursuing bookstore appearances and media interviews ("out of the back of his station wagon", according to Michael Korda, making the best-seller lists "before book publishers even noticed what was happening"), which eventually led to national television talk shows including Merv Griffin, The Tonight Show, and Phil Donahue. Dyer proceeded to build on his success with lecture tours, a series of audiotapes, and regular publication of new books. Dyer's audience was not limited to business as with Dale Carnegie or Stephen Covey, and so his message resonated with many in the New Thought Movement and beyond . He often recounted anecdotes from his family life, and repeatedly used his own life experience as an example. His self-made man success story was a part of his appeal. Dyer told readers to pursue self actualization, calling reliance on the self as a guide a "religious" experience, and suggested that readers emulate Jesus Christ, whom he termed both an example of a self-actualized person, and a "preacher of self-reliance". Dyer criticized societal focus on guilt, which he saw as an unhealthy immobilization in the present due to actions taken in the past. He advocated readers to see how parents, institutions, and even they, themselves, have imposed guilt trips upon themselves. Although Dyer resisted the spiritual tag, by the 1990s he was altering his message to include more components of spirituality, in Real Magic, and higher consciousness, in Your Sacred Self. Currently, his focus is on interpretations of Tao Te Ching and he has many US speaking engagements. "My belief is that the truth is a truth until you organize it, and then becomes a lie. I don't think that Jesus was teaching Christianity, Jesus was teaching kindness, love, concern, and peace. What I tell people is don't be Christian, be Christ-like. Don't be Buddhist, be Buddha-like." "Religion is orthodoxy, rules and historical scriptures maintained by people over long periods of time. Generally people are raised to obey the customs and practices of that religion without question. These are customs and expectations from outside the person and do not fit my definition of spiritual." Acknowledged as one of the world's greatest leaders in the field of mind body medicine, Deepak Chopra, M.D. continues to transform our understanding of the meaning of health. Through his creation of The Chopra Center for Well Being in California in 1995, Chopra established a formal vehicle for the expansion of his healing approach using the integration of the best of western medicine with natural healing traditions. Dr. Chopra serves as the Director of Education at The Chopra Center, which offers training programs in mind body medicine (Journey into Healing). The University of California, San Diego School of Medicine has granted continuing medical education credits for this program, which satisfies requirements for the American Medical Association Physician’s Recognition Award. Through his partnership with David Simon, M.D. and numerous health care professionals in both conventional and complementary healing arts, Chopra's work is changing the way the world views physical, mental, emotional, spiritual and social wellness. What prompted Deepak Chopra to expand his view of conventional medicine to embrace complementary treatments from around the world? Formerly the Chief of Staff at Boston Regional Medical Center, Dr. Chopra built a successful endocrinology practice in Boston in the 1980's. His teaching affiliations included Tufts University and Boston University Schools of Medicine. Chopra realized in his medical practice that there was potential in western medicine for the establishment of a new life-giving paradigm, one which encompassed the fundamental principle that perfect health is more than just the absence of disease. He began to envision a medical system based upon the premise that health is a lively state of balance and integration of body, mind and spirit. He is widely credited with melding modern theories of quantum physics with the timeless wisdom of ancient cultures. In 1992, he served on the National Institutes of Health Ad Hoc Panel on Alternative Medicine. 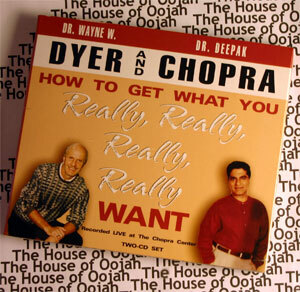 Chopra is known as the prolific author of over 45 books, more than 100 audio, video and CD-ROM titles which have been translated into 35 languages with over 20 million copies sold worldwide. His book, Peace Is the Way (Harmony Books) won the Quill Awards and The Book of Secrets: Unlocking the Hidden Dimensions of your Life was awarded the Nautilus Award. Some of his best-sellers include The Spontaneous Fulfillment of Desire: Harnessing the Infinite Power of Coincidence., How to Know God: The Soul’s Journey into the Mystery of Mysteries, Perfect Health; Ageless Body, Timeless Mind; The Seven Spiritual Laws of Success, Grow Younger, Live Longer: 10 Steps to Reverse Aging; and The Path to Love and Kama Sutra: Including the Seven Spiritual Laws of Love. Chopra has published numerous books focusing on health issues that include Magical Beginnings, Enchanted Lives: A Holistic Guide to Pregnancy and Childbirth; The Chopra Center Herbal Handbook: Forty Natural Prescriptions for Perfect Health; Perfect Weight: The Complete Mind / Body Program For Achieving and Maintaining Your Ideal Weight; Restful Sleep: The Complete Mind / Body Program For Overcoming Insomnia; Quantum Healing: Exploring the Frontiers of Mind / Body Medicine; and Creating Health. Popular audio books and CD-ROMS include Magical Mind, Magical Body; The Higher Self; Journey to the Boundless; and The Wisdom Within. Many know him from his regular work with PBS, which includes The Soul of Healing: Body, Mind, and Soul; Body, Mind and Soul: The Mystery and The Magic, one of the most highly viewed and successful fund-raisers in the history of the network; and The Way of the Wizard, Alchemy and The Crystal Cave. His latest book is Power, Freedom, and Grace: Living from the Source of Lasting Happiness. Deepak Chopra's popularity as an international presenter and keynote speaker is exemplified in an impressive list of honorariums. As the keynote speaker, he appeared at the inauguration of the State of the World Forum, hosted by Mikhail Gorbachev and the Peace and Human Progress Foundation, founded by the former president of Costa Rica and Nobel Peace prizewinner Oscar Arias. Esquire Magazine designated him as one of the top ten motivational speakers in the country; and in 1995, he joined the distinguished company of President Nelson Mandela, Congresswoman Barbara Jordan, Tom Peters and Garrison Keillor as a recipient of the Toastmasters International Top Five Outstanding Speakers award. He participates annually as a lecturer at the Update in Internal Medicine event sponsored by Harvard Medical School, Department of Continuing Education and the Department of Medicine, Beth Israel Deaconess Medical Center in 1997. Chopra has been a keynote speaker at several academic institutions including Harvard Divinity School, Harvard Business School, and serves as an Adjunct Professor at Kellogg School of Management. He is the recipient of the Einstein Award through Albert Einstein College of Medicine in collaboration with the American Journal of Psychotherapy. Along with Nobel Peace Laureates Oscar Arias, Betty Williams and others, Deepak Chopra is a founding director of and President of the Alliance for a New Humanity. The Alliance for a New Humanity is committed to creating a critical mass of consciousness in the world for social justice, economical freedom, ecological balance and conflict resolution. Chopra joined The Gallup Organization as a Senior Scientist in 2005. He regularly mentors corporate and political leaders through his Soul of Leadership workshops. Through The Chopra Center, Dr. Chopra is revolutionizing common wisdom about the crucial connection between body, mind, spirit, and healing. His mission of "bridging the technological miracles of the west with the wisdom of the east" remains his thrust as he and his colleagues conduct public seminars and workshops and provide training for health care professionals around the world. Dr. Chopra is a fellow of the American College of Physicians and a member of the American Association of Clinical Endocrinologists. Deepak founded the Chopra Center more than a decade ago with David Simon, MD to create a place where individuals from around the world could come to balance, heal, and transform. In addition to the Center for Wellbeing in Carlsbad, California, there is a Chopra Center & Spa at Dream NY in Manhattan. Future locations are Westminster, Colorado and Punta Mita, Mexico.